Here you can find all information about the cannabis breeder Dying Breed Seeds. We've collected data about 11 Cannabis Strains breed by Dying Breed Seeds. Click on the strains to find more informations, pictures, reviews, comparisons and sources for a variety - and/or check out the Breeder Info here at the page to find out more about Dying Breed Seeds. Its also possible to visualize all Dying Breed Seeds strains together with all their Parents or Hybrids with our dynamic maps - check it out! Click here to visualize all Dying Breed Seeds strains including all known hybrids and descendants with our dynamic map! Here you can watch all Dying Breed Seeds strains and their ancestors (sorted by origin) with our dynamic strain map! 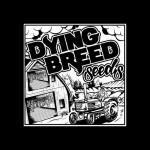 DYING BREED SEEDS from Mendocino, California. Led by Shiloh Massive and the 3rd Gen Family, DYING BREED SEEDS has swept up cups and competitions throughout Northern California., Rooted in the heart of the Emerald Triangle in California, these farmers have decades of farming experience and genetic expertise. The incredible variety of flavors and cultures that congregate in Mendocino have made it possible for DYING BREED SEEDS to bring some of the finest selections in the world., We have seen the work these guys do and we are confident that these seeds will bring you lots of success. From general vitality to flavor potential, these genetics have what it takes to take a garden to the top.